By John C. Toman. Posted May 20, 2012, 12:18 PM. Sunday evening will feature an annular solar eclipse, the first over the continental United States since 1994. The moon's coverage over the sun is expected to peak at 76% this evening. The peak will be 6:38pm in Riverside and 6:40pm in San Diego, according to the National Weather Service. In Riverside County, the eclipse should begin soon after the Thunderbirds are done with their show at March Air Reserve Base. Low clouds at the beach areas may keep the eclipse out of view this evening, but inland areas are predicted to be clear. Eclipses should not be viewed with the naked eye, nor are sunglasses strong enough to prevent eye damage. Special eclipse viewing glasses are required. An annular eclipse means the moon is smaller than the sun. It's often referred to as a "ring of fire" eclipse. 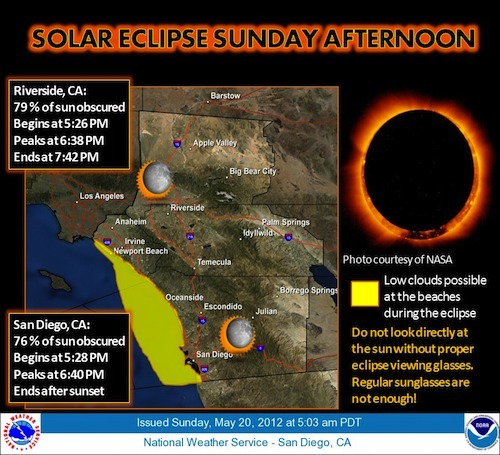 Despite this, in Southern California, Sunday's eclipse will appear to be partial. Annular solar eclipse over Southern California. Courtesy of National Weather Service.